This is your friendly reminder that you can get your Bout of Books fill in ONE week on NOVEMBER 2ND. In one week, on Saturday, November 2nd at 10am CDT (time zone conversion), we're going to have Get Your Fix #boutofbooks chat. So join us on November 2nd. Tweet that you're going to be there! Need a Bout of Books Fix Before 9.0? Get your Bout of Books fill on NOVEMBER 2ND. 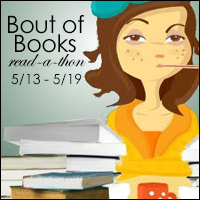 On Saturday, November 2nd at 10am CDT (time zone conversion), we're going to have Get Your Fix #boutofbooks chat.